Unless they’re Luka Cimolini?a graphic designer who knows just how to massage the RS fairing into something more appealing. 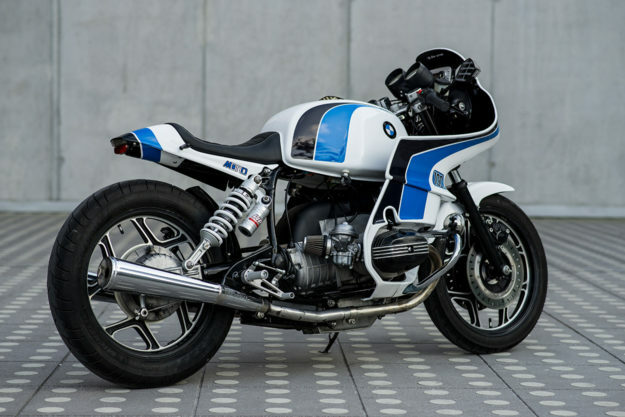 This is his second R100 ‘RC’ (‘Reise Custom’) build, and it’s even more intriguing than the first. “Designing and building customs is my hobby, a way of spending free time,” Luka tells us. “I have a small oil-stained garage in Slovenia, where I make one custom per year.? Luka’s head was full of leftover ideas after his last RS build?which is exactly why he decided to take on another one. Only this time, he grabbed a newer model: an 87, complete with a single-sided ‘monolever’ swing arm. It created the opportunity to create a super-sano rear end?with a discreet, custom-made subframe. The sharp tail section was hand-made in fiberglass, with the seat covered in Alcantara. Naturally, the BMW’s most striking feature is the trimmed RS fairing. It’s a more radical chop than Luka’s last effort, that certainly won’t butter everyone’s toast?but we find it curiously appealing. The stock headlight and dials are still present?but Luka’s ditched the original clock and voltmeter. In their place is a Koso Mini3 unit that handles both functions, as well as displaying ambient temperature. So he’s installed LED’s all over: a tail light from Koso, tiny Highsider turn signals out back, and Magazi mirrors with integrated signals up front. Other upgrades include Tarozzi rear-sets on one-off mounting plates, and a fully adjustable WP Suspension rear shock. Luka’s fettled the front end too. The forks have been dropped?capped off with a top triple clamp from a different Beemer, and a set of Magura clip-ons. The front fender is the stock unit, trimmed. ?Every time I finish building one bike,? says Luka, ?my mind gets full of new ideas?so I can?t wait to start another project.? Oil Stain Garage | Images by Miha Peterli?